France-based ODC Marine, a developer of electric and hybrid small-to-medium work boats, has delivered the 12-metre all-electric passenger vessel ‘Le Foue’ from its Dalian-based shipbuilding arm. Designed by naval architect Eric Jean, the passenger vessel measures 12.7 metres in length overall, with a waterline length of 11.5 metres, a beam of 4.2 metres, and a draught of 1.05 metres. Displacing nine tonnes, the vessel will be used for tourist operations on Lake Leman, the French region of Lake Geneva. Built under survey to French Lake Regulation, the French-flagged vessel will be home ported in the lakeside village of Yvoire and operated by L’Helionaute. the ‘Le Foue’ is powered by a pair of 20kW electric motors driving ZF propellers in shafts. For added manoeuvrability, a 5kW side thruster has also been installed. This propulsion package is entirely battery-powered, with two 70kW/h lithium iron phosphate batteries providing the main energy supply, with an additional two 200A/h backup batteries for added safety and redundancy. 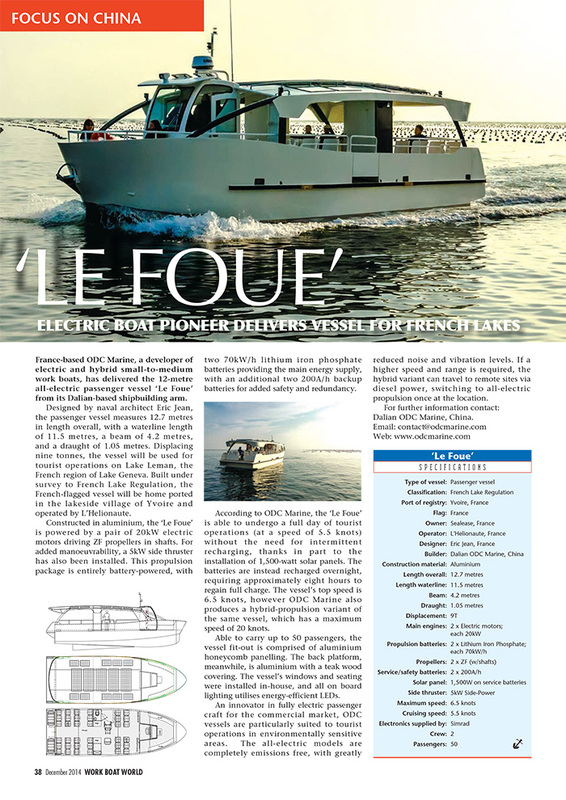 According to ODC Marine, the ‘Le Foue’ is able to undergo a full day of tourist operations (at a speed of 5.5 knots) without the need for intermittent recharging, thanks in part to the installation of 1,500-watt solar panels. The batteries are instead recharged overnight, requiring approximately eight hours to regain full charge. The vessel’s top speed is 6.5 knots, however ODC Marine also produces a hybrid-propulsion variant of the same vessel, which has a maximum speed of 20 knots. Able to carry up to 50 passengers, the vessel fit-out is comprised of aluminium honeycomb panelling. The back platform, meanwhile, is aluminium with a teak wood covering. The vessel’s windows and seating were installed in-house, and all on board lighting utilises energy-efficient LEDs. An innovator in fully electric passenger craft for the commercial market, ODC vessels are particularly suited to tourist operations in environmentally sensitive areas. The all-electric models are completely emissions free, with greatly reduced noise and vibration levels. If a higher speed and range is required, the hybrid variant can travel to remote sites via diesel power, switching to all-electric propulsion once at the location.